14-track full-length album. Released on 02-13-10. Recorded live on 10-22-09 at Swine My Brother Studios, mostly in single takes, by Jonathan Leon. Mixed and mastered by Jonathan Leon. 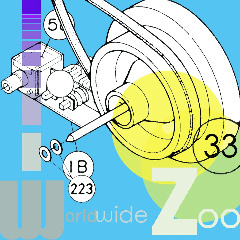 Produced by Worldwide Zoo and Jonathan Leon. Artwork and layout by Craig Kaths. Limited to 1000 copies. Price includes postage within the lower 48 states. If you are outside the lower 48, please contact for a shipping quote. 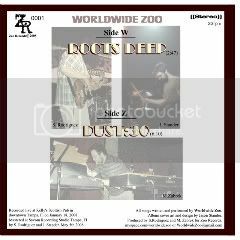 The first official Worldwide Zoo release brings two sides of the band to you. Roots Deep is tangent psych-jazz at it's finest, while Dust:30 on the B-side finds the band dipping their toes into an Afro-Beat-ish mood. Recorded live at Kelly's Pub (now Karma Bar and Grill) on 01-18-08. Original cover art and layout by our none other than Jason Stander. 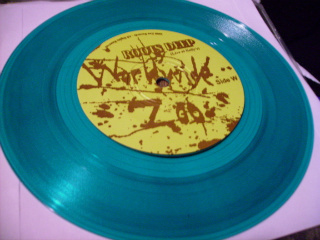 1st pressing limited to 500 hand-numbered copies on green vinyl! Price includes postage within the lower 48 states. If you are outside the lower 48, please contact for a shipping quote. 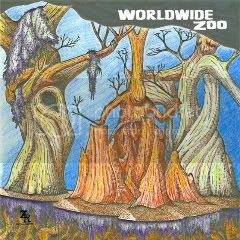 The first official Worldwide Zoo release brings two sides of the band to you. Roots Deep is tangent psych-jazz at it's finest, while Dust:30 on the B-side finds the band dipping their toes into an Afro-Beat-ish mood. Recorded live at Kelly's Pub (now Karma Bar and Grill) on 01-18-08. Original cover art and layout by our none other than Jason Stander. 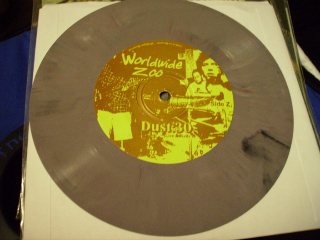 1st pressing limited to 500 hand-numbered copies on mixed vinyl! Price includes postage within the lower 48 states. If you are outside the lower 48, please contact for a shipping quote. The one that started it all! Voted "Best Band Shirt" by the music fans of the Tampa Bay area for the first annual "State of the Scene" in Reax Magazine. Pick one up and be cooler than all of your friends. 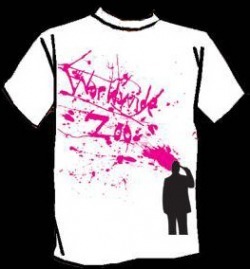 Available in green, pink, or silver splatter on white shirts. Sizes available from youth small to adult extra large. Price includes postage within the lower 48 states. If you are outside the lower 48, please contact for a shipping quote. If you have any questions, need a non-lower 48 shipping quote, or want to check on the availability of an item please use the contact link and someone will respond to you within 24 hours.